As some readers will know, I have a great interest in prosthetics and other aids that help people to overcome barriers due to their being in some way different. Recently I wrote articles about prosthetic limbs, interviewed the World record holding runner Martina Caironi and looked at canes for the blind. Many posts ago I looked at elective amputation, and today I would like to cast my gaze over exoskeletons. 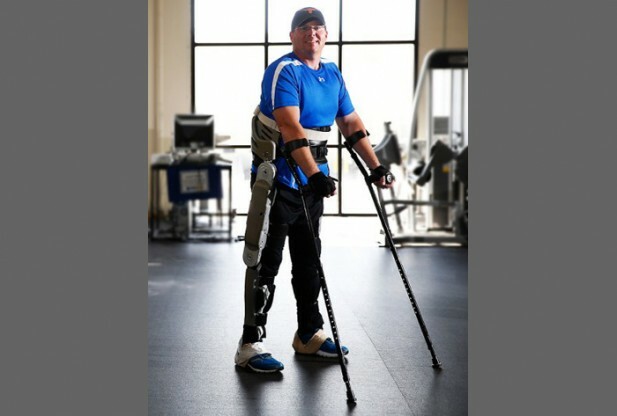 Companies have now started to produce powered exoskeletons in various forms, for both military and civilian use. Dual use technology has also always been of interest to me for some time, as it is difficult to see how we could draw a line between civilian use and development and military use. If we think that most robot limb and hand developments are geared towards treating soldiers who have been injured while on active service, then we see why the military is the largest investor in such research. If we take the powered exoskeleton the link is more obvious. 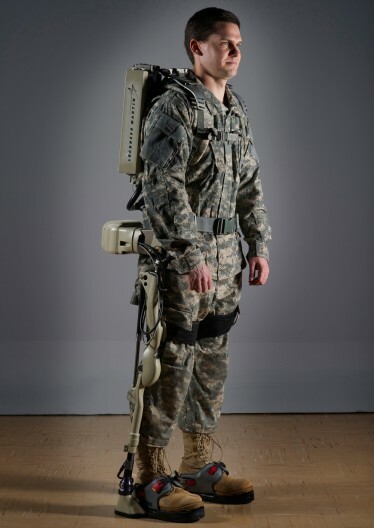 The military want an armoured exoskeleton that supports itself (so the soldier does not have to carry the weight) that can enable said soldier to carry more ammunition and supplies, heavier weaponry and move quicker and for a longer period of time. Robocop comes to mind. But one thing is for sure, the FDA recently gave approval for the sales of the first exoskeleton in the USA, and you can also get one if you live in Europe or parts of the Middle East (at a cost of about $65,000), and so they will soon be seen on the streets. And there are also many applications in hospital. The machines are used to get people walking again who have had accidents, to build up muscle and to aid other forms of rehab such as balance loss. Who could say that technology that allows someone to walk again after years in a wheelchair is a bad thing? Well there are actually some arguments related to this. Many of the following are taken from an article called Exoskeletons in a disabilities context: the need for social and ethical research , written by Jathan Sadowski of Arizona State University and available here (payment required). One problem is that creating the model of how it is correct to move and “be”, makes the non acceptability of alternatives worse. To give an example, the more technology works towards making us all walk upright, as many humans do, the more those who do not walk upright become marginalized. Society does not change to incorporate the differences, but moves to “rectify” the differences, as if it was just a problem to be solved. This may not be the right approach. This wonderful article by Jenny Davis explains all. Another possible problem is dependence. If a person has access to such a machine they may grow to be dependent upon it. What happens if they lose the use of the machine? If they can no longer afford it, or it is withdrawn, or breaks down? With dependency comes withdrawal, and we might imagine that it would be serious cold turkey in this case. And all this comes without mention of the problem of availability to all. These systems are not cheap. There are many industrial applications that relate to the needs for the soldiers above, allowing workers to carry heavy objects for long periods of time, or use heavier machinery, something that could on the surface be seen as little more than an advancement in industrialized production methods. This kind of technology would be fantastic for disaster workers too, as well as fire fighters and people working in remote areas or difficult to access spaces. Here are a couple of links that you might be interested in. This Forbes video shows the development of a new military exoskeleton, once more explaining its civilian use. This TED talk is a little older, showing the development of the same project. Neither has any critical view of the technology however, and the TED talk almost looks like publicity. In some of the cases above the use of this technology could undoubtedly be described as human enhancement. In others some would say that it is something more akin to a mechanical wheelchair that improves mobility. But one thing is for sure, as Sadowski point out in the article cited above, “any serious consideration – whether critique, condemnation, or support – of enhancement technologies must also incorporate critical inquiry about ethics, politics, justice, and social relations”. You are always making me think. “Society does not change to incorporate the differences, but moves to “rectify” the differences, as if it was just a problem to be solved. “ – what a great quote! Brilliant article, really very interesting. A very tidy update on the one I wrote about bionic suits 2 years ago. You naturally took a completely different approach. I would love to use one and see what they feel like. Well I am pleased that I can still stimulate the grey matter. I think these suits are closer than you think. Not necessarily just in robotic terms either. Take a look at the bionic boot, a real DIY solution that works incredibly well. http://www.bionicboot.com/. The idea that I tried to express above about society is part of a thought movement known as ableism. The issue today though is that we might not be able to remain able as able means better than human. Ableism… I need to add that to my vocabulary! I love the whole exoskelton concept and I am really excited by where it is all heading. I can understand the argument that Jenny Davis is putting forward however I would have thought that anything that provides additional mobility to the disabled must be good.